Nine-Thirty to Five is one of my new favorite blogs. It’s two attorney friends who take pictures of what they wore to the office. Super cute outfits that I can make with clothes already in my closet! I just pinned about a thousand outfits as inspiration. I love this outfit. This greenish-yellowish cardigan might be my all time favorite cardigan. (And as a cardigan addict that is a really difficult choice to make.) 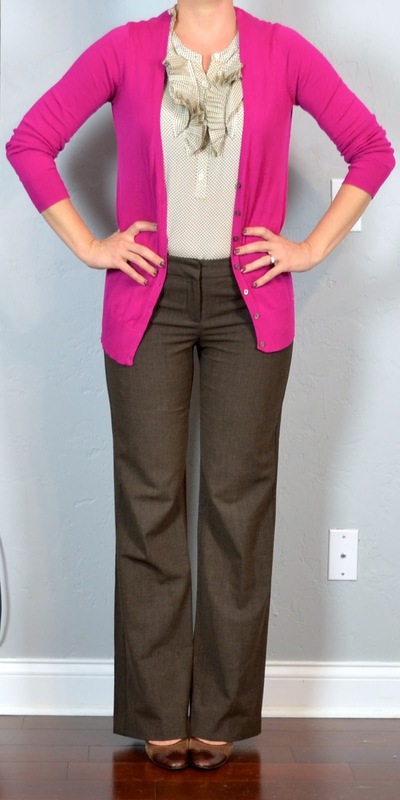 Plus it’s all the elements of my favorite work uniform: basic bottom, top with interest plus a fun cardigan. Yay! ok…feeling really stupid. The blog you suggested(9:30-5:00) is really cute but how the heck do you subscribe to it? Love that green! It's just perfect with that navy skirt! Now on to checking that blog out! I'm not sure. Depends on how you're trying to subscribe. You can probably just drop the URL into a feedreader like Feedly or Bloglines or Bloglovin. But if you're looking for an email subscription – that would just depend if they have one set up. Maybe drop them a comment to ask? Yay! Thanks so much for letting me use your photo as inspiration!